Peaches for Tebow. Let’s Get This Done. It’s been an amazing couple of weeks if you’re an NFL fan. Especially if you’re a Denver Broncos fan. And this is only the offseason. What a wondrous sight to behold. 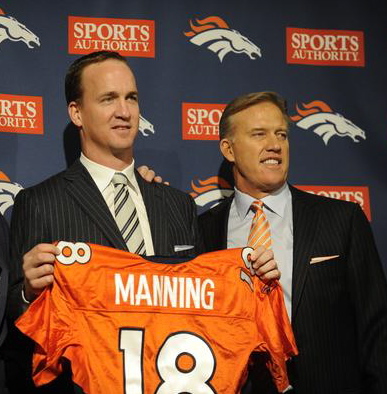 First came Manningwatch 2012. I haven’t seen the media this obsessed with somebody’s every move since a certain white Ford Bronco sped down a certain Los Angeles freeway lo these many years ago. It was kind of like a real-life version of Where’s Waldo?, only everybody knew exactly where Peyton Manning was at every second of the day. The “breaking news” reports bordered on silly after awhile. Peyton’s plane has just landed at Denver International Airport. Peyton is eating dinner at a country club with John Elway. Peyton is accidentally using his salad fork to eat his steak. Peyton ordered a side of asparagus and when he went to the bathroom his pee smelled funny. You gotta feel sorry for the guy. I mean, as sorry as you can possibly feel for somebody who just signed a $96 million contract despite the fact that he’s got a bum neck and is considered “old” by football standards. My neck is perfectly fine, and I’d be content with fifteen bucks an hour at this point. Employers, take note. The guy I really feel sorry for, though, is Tim Tebow. A scant few months ago he was the Second Coming of Christ. Or at least had a direct hotline to J.C.’s daddy. I’m a little sketchy on the details. The point is, the guy was being revered for his late-game heroics and miraculous comeback victories. And then, in the blink of an eye, was unceremoniously dumped in the New York Jets’ laps for a couple of low draft picks. I’m pretty sure when he was praying for his team to find success, trading him away for next to nothing isn’t what he had in mind. But it’s a business, and as a diehard Broncos fan, I can’t fault the organization for making the moves they did. Bringing Peyton aboard is a huge coup and, while some might argue otherwise, makes the team instant Super Bowl contenders. I just wish their top brass had contacted me before the Jets. I’d have liked to put in an offer for Tim myself. He wouldn’t be my starting quarterback seeing that I don’t own an NFL team or anything – details, details – but I could use some help around the house. Sometimes I pray that the dishes in the sink will clean themselves, and yet, that almost never happens. OK, never happens. And, despite my most fervent wishes, the dirty litter box only gets dirtier the longer I go without scooping it. And, grocery shopping. I hate dealing with crowds. Mr. Tebow is used to playing in sold-out stadiums surrounded by 60,000 screaming fans. He orchestrated an 80-yard touchdown pass 11 seconds into overtime to beat the heavily favored Pittsburgh Steelers in the playoffs. Certainly a trip to Safeway for a can of tuna and a box of Zatarain’s where there’s a screaming three-year-old kid and a checkout aisle four deep is nothin’. Sure, it ain’t glamorous work, but is being a backup QB for a crappy team really any better? Besides, in the glare of the Big Apple spotlight, any tiny mistake Tim makes is going to be examined and debated and thrust down the throats of New Yorkers ad nauseum. I can promise Tim that if my wine glass has a few water spots on it after washing, I won’t make a big deal of the fact. I think I would have had a real shot at the guy, too. If the Broncos were willing to settle for two measly draft picks, they might have been willing to entertain my offer. I’ve got a bread machine I hardly use and a couple of lava lamps just gathering dust. Oh, and some peaches in light syrup that have been sitting in the back of the pantry forever. 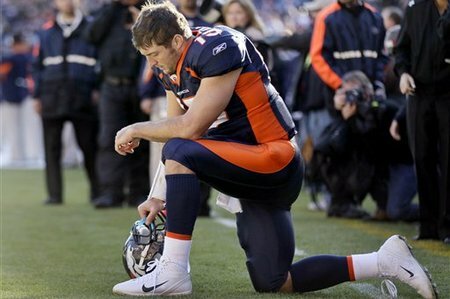 Alas, it is Tebow Time no more in Denver. You know what would be cool? If we could trade real people the way we trade athletes. Take my newspaper delivery guy, for instance. Maybe he’s no longer at the top of his game. Sure, sometimes he shows flashes of his former brilliance, depositing the paper right next to my door and making sure it’s wrapped tightly in plastic to protect it from the rain. But more often than not, the paper is strewn haphazardly several feet from the front door, forcing me to take two or three steps across the cold, dirty concrete – in my bare feet, no less – in order to retrieve it. Maybe there’s some really awesome newspaper guy in Cincinnati or Miami, one who lays that sucker neatly by the door every single morning. That’s the guy I want delivering my paper, so I make a few calls, and suddenly they’re switching routes! I might have to add in another person or two to sweeten the pot, say the coworker in the adjoining cubicle who wears too much damn perfume but always brings in the best desserts for potlucks. I’m sure we could come to a consensus. Plus, if a relationship isn’t working out, you’ve got an easy way to solve that particular dilemma. Hell, I’d have traded in my last three girlfriends – plus cash – for Tara. She has vastly improved the quality of my life, after all. I only wish it had happened sooner. And while we’re on the subject of football, I am still sore over that $20 I lost to my dad two years ago when he bet me the New Orleans Saints would go all the way and win the Super Bowl. They did…but it turns out, they kinda cheated, putting out incentive-laden bounties on opposing players. That’s just wrong, on so many levels. I’m coming over for dinner tonight, and I gotta warn you, dad – I want my money back. Dang. I was hoping my value was at least a little more than Tebow. Not only can I scoop the litter box, go shopping, and wash dishes, there’s a ton of other stuff I’m pretty sure Tebow would never do for (to) you. No matter how much he was paid. Such a big distinction between two little words…”for” and “to.” How the mind races. And baby, you’re worth 10 Tebows…and a Peyton Manning. This is too/to perfect! Tara! I’m amazed at how many teams share your sentiment, Michelle. It’ll be interesting to see how – or if – he progresses over the next few seasons. I, too, pray the dishes get done, but I didn’t realize not having Tebow (or Tara?) was my problem. Sorry, Tara comment was too damn funny! Yes, she’s quite the humorous one, huh? Which – along with intelligence – is a big turn on. A killer rack never hurts, either. Bwhahahahahhahahahaha! That CRACKED ME UP!!! OMG, you’re kidding me, 96 MILLION dollars?!?!? Oh yes, I feel VERY sorry for him. Yes, $96 million. Boggles the mind, doesn’t it? But here’s a clause in there that states, if his neck injury sidelines him, he’ll only make $18 million.